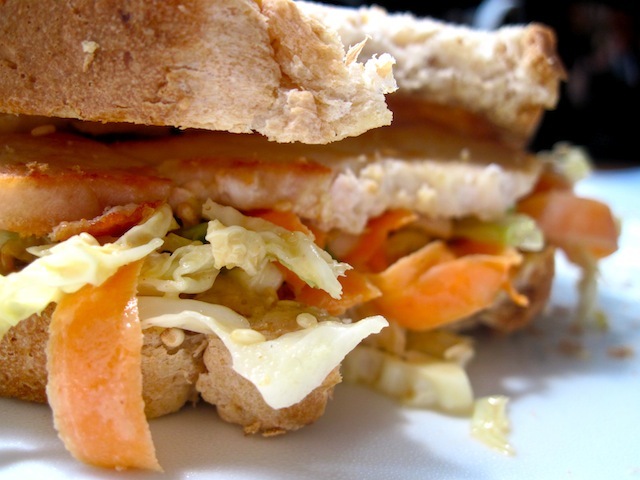 Summer Lunch: Thai Chicken Sandwich – Eat Me. Drink Me. Partly because it’s unbearably hot everywhere in New York and partly because I’ve been ridiculously busy, I haven’t really been cooking much, writing much, or even eating much. I’ve made pilgrimages to my favorites, Roberta’s and the Tortilleria, tried out new places like Taïm for falafels and the Shake Shack (more on that lovely experience later) for burgers and concretes, but for the most part, I’m living on ice pops, toast, and cold beer. But since it’s only 88 today in Brooklyn and because I want to celebrate the lease I just signed, I decided to make a sandwich. A sandwich is very rarely inappropriate. There are sandwiches bursting with lettuce and avocados for summer or fresh paninis with tomatoes, mozzarella, and basil. For winter, there are concoctions of melted cheese and sweet onions. Olives, feta, roast beef, eggplant, actually anything can find a home between two slices of bread. Bread like a blanket. Bread like your mother’s arms or puppies or unexpected gifts. Bread the panacea. I find a nub of cabbage in the fridge. I think it’s over a month old, but with the outer layer cut off, it’s still crisp and fresh inside. Cabbage, hardworking and versatile, resilient, maligned as famine food, but good in times of plenty, also. I dress it with tahini, peanut butter, soy sauce, and lime, drape it over two slices of toast and top with slivers of chicken breast. I wish I had better bread, but a sandwich is still good on Arnold’s whole wheat pre-sliced loaf, especially when the dressing is nutty, sweet, spicy, salty, and when there is cabbage to promise that under summer’s lethargy and sweat is something fresh and full of potential waiting to be revealed. 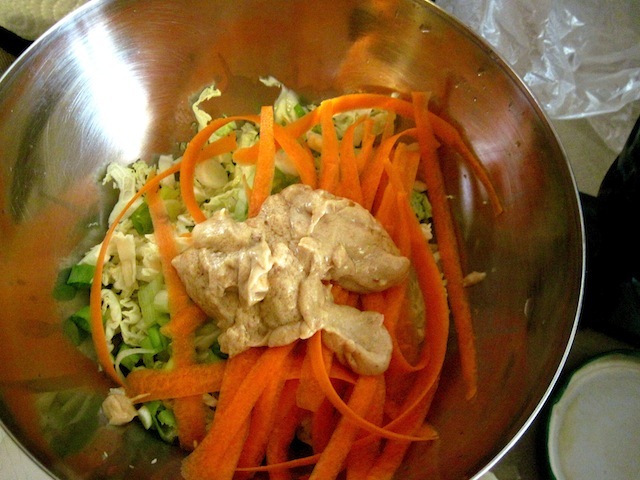 Toss cabbage, carrots, and green onions together and douse with a generous splash of rice wine vinegar. 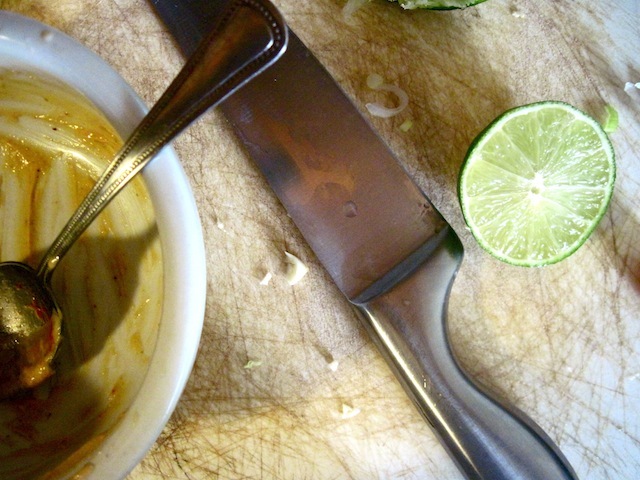 For the dressing, mix tahini, peanut butter, soy sauce, lime, sriracha, garlic, salt, and pepper until smooth. Blend into cabbage. Toast two slices of bread. Thinly slice chicken breast and sauté in safflower oil until golden. 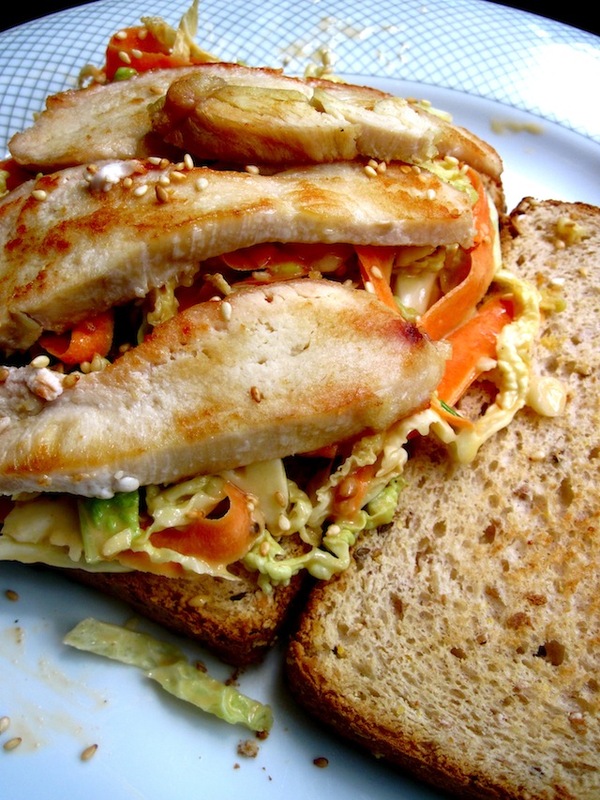 Assemble sandwich: bread, slaw, chicken, sesame seeds, bread.